Sir Paul Smith makes design clothes with a feel good attitude. The clothing is all about being well-made, good quality, interesting fabrics with other words No Nonsense clothing. 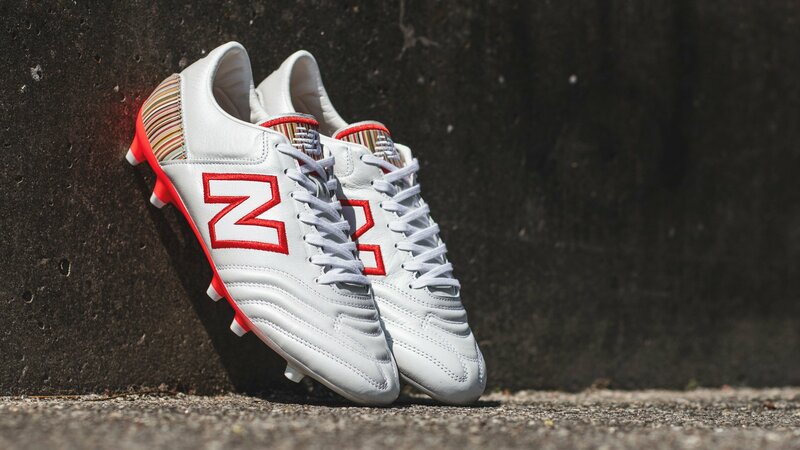 New Balance teamed up with Paul Smith to make, what might be, the most fashionable football boot ever, combined with his mantra of ‘classic with a twist’. Sir Paul Smith collections demonstrates his love for classic English tailoring and eye for proportion and details. He does this by updating classic men’s clothes with contemporary cuts and unexpected details, which sometimes features vibrantly coloured linings. These vibrant linings is something which is taken into the new Balance boots, as it is they key design factor of the boots. The New Balance Paul Smith football boots are made in a clean design, with a predominantly white colour with a K-leather upper. The boot features a red trim on the middle which is representing the ‘N’ branding, while almost half of the soleplate is red and the other half in white. The vibrant linings, or multicoloured design, are placed on the heel of the boots and on the tongue, giving the boot a true Paul Smith look. Furthermore, these vibrant linings are also placed in the insole, which is out of this world. To top it off the insole is also marked with the signature Paul Smith logo. Everything on this football boot screams about class and style. It’s like meant to be for the midfield generals who dictate and play football with a hint of class. The boots also have conical studs allowing you to turn and maneuver with the ball even better, making you control the area with ease. The upper is made from K-leather, which with is softness add another level of comfort and touch to you game. Made for the true fan of football and Paul Smith. Add this very Limited Edition boot to your Paul Smith collection already today!